We’re in the thick of the hard part. The pace of decision-making has ramped up ferociously. Finish material choices now need to be set in stone . . . or wood, metal or glass. We’ve spent hours and hours and hours studying the plans and then walking the halls (and rooms and stairway and closets and . . .) to get our electrical outlets and switches and light fixtures just where they ought to be. 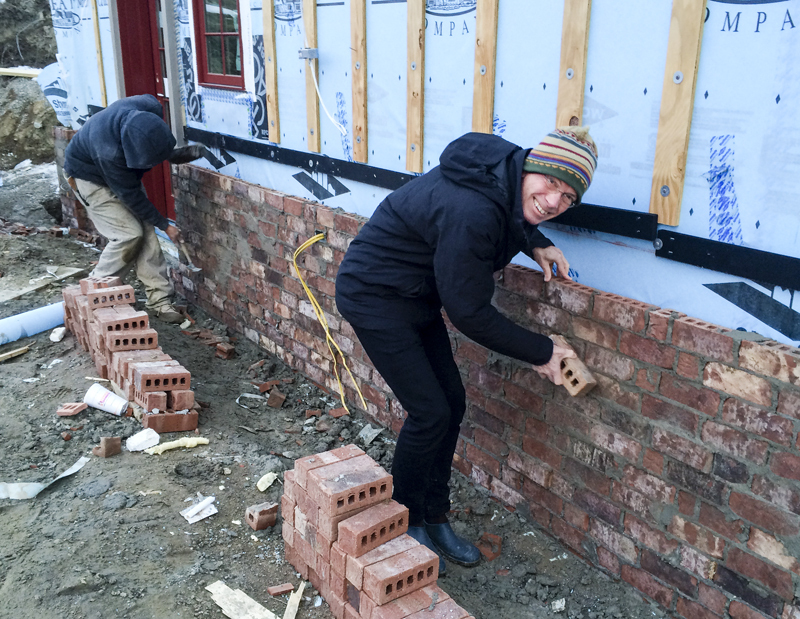 Tom has worked more than a few hours this past week with the bricklayer, figuring out how to achieve the aged, weathered, “rubble-y” look we want. We’ve paid close attention this week to placement of plumbing and cooling pipes and fixtures. In each of these cases, we’ve found things to adjust and change. Many people would not spend such great amounts of time and attention, assuming that the tradesmen and the pros and know precisely what to do in every situation. Our experience through the years, though, has shown that we’re all human, prone to error and to our own best guesses as to what’s right or wrong, good or bad. In addition, Tom and I find ourselves looking closely at every detail, knowing from experience that it can be the details that make the difference between “nice” and enduringly delightful. We’ve learned tremendous amounts from workmen on our building projects – and we assume they also learn from us. Or at least they’re gracious, kind and accommodating when we ask for a change or for something specific and out of the ordinary. It would be oh-so-easy for worker-customer relationships be strained over building mistakes or over the endless requests from picky clients. It takes big hearts, full of trust in the other’s good integrity and good intentions, to keep smoothing out rough edges in relationships. Tom and I feel more than fortunate to be surrounded by a team of people who all have the biggest of hearts, and who value, as we do, the friendships forged in this undertaking. That alone makes this Living Building project worth it. To all members of the Local 951 Mason’s Union: Keep an eye out for this intruder. This so-called wanna-be mason dude has been working all over with no Union Card. Paid no union dues, etc. No steel-toed shoes, clearly inappropriate work clothes . . . shameful. If you see him put some mortar in his oatmeal.